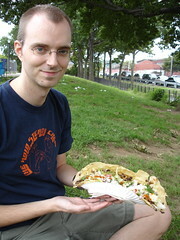 Let’s keep it a secret between you and me and the readers of the New York Times, there’s some really great cheap Latin food available down by the Red Hook soccer fields. Tacos, pupusas, quesadillas so big they’ll break off your arm. Last year when we went, we were the only white people around. Now, there’s white people everywhere… If you’ve got a Fairway and some nice pupusas, you’ve got yourself a neighborhood. [UPDATE 9/11/2006] Food is available every Saturday and Sunday during soccer season. You should go soon, because the season ends in a few weeks.